Ladies (and the few gents that read my blog) spring has sprung! The sun finally came out and I had to take full advantage by letting my legs get some sun (yep, I know they are in desperate need). Thankfully this new addition to my wardrobe, the cabi "playa" playsuit, was ready to be worn. I have never been a playsuit kind of girl, actually now that I think about it I don’t own any because they usually look funny on me (I blame my long legs and what I think is a short torso HA!) so when I was eye’ing this playsuit it looked soooo good on the model PLUS I’m very confident in cabi’s fit, that I decided to give it a chance. The verdict: When it arrived I anxiously tried it on and loved the fit, the cut, and most importantly the material because it was so comfortable! This playsuit has an opening in the back and has pockets which makes it look like two pieces paired together. And so, this has become the first playsuit in my wardrobe. If you're into this playsuit cabi has a pant-version one too here! This playsuit is from cabi’s latest New Arrivals Collection Elegancia. 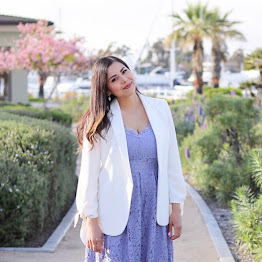 I recently talked about and featured some pieces from cabi’s Spring2018 collection, well the Elegancia collection brings in 15 additional pieces that not only complement the Spring collection, but are great staple pieces to have in your wardrobe all year round. In this outfit, I have paired the playsuit from the Elegancia New arrivals with the other pieces from the cabi Spring 2018 collection and I already have a vision of pairing this playsuit with sneakers for when I'm mommy-on-the-go which is like, always... #momlife. These cabi pieces can only be purchased through a personal cabi Stylist, however cabi has just unveiled cabi Tap, an app where you can instantly shop my entire look and get automatically paired with a local Stylist at the same time! Both ways of purchasing still give you that personal touch from a cabi Stylist which in my opinion is invaluable and what makes cabi so unique. Feel free to email me if you have any questions or comment below your thoughts! This outfit is so gorgeous! Obsessed with those red shoes. They are fabulous!